PLEASE READ BEFORE PURCHASING: Cookies are baked fresh and shipped out ONE WEEK after date of purchase, excluding Sundays and postal holidays. Orders are shipped USPS Priority Mail (approximately 3-5 days in transit, however not guaranteed.) If you are ordering for a specific date, please order at least two weeks in advance. If you need your cookies in less than two weeks, please contact me for my availability to rush your order. Orders WILL NOT ship in less than one week after the date of purchase (excluding Sundays and postal holidays) if prior arrangements have not been made to rush the order. Advance orders are welcome! During checkout put the date you need your order for in the "note to seller" section. Please note, need by dates MUST be at least two weeks after the date of purchase. If you need your cookies sooner, please contact me before ordering to find out my availability to do a rush order. Squirrels and acorns just in time for fall! 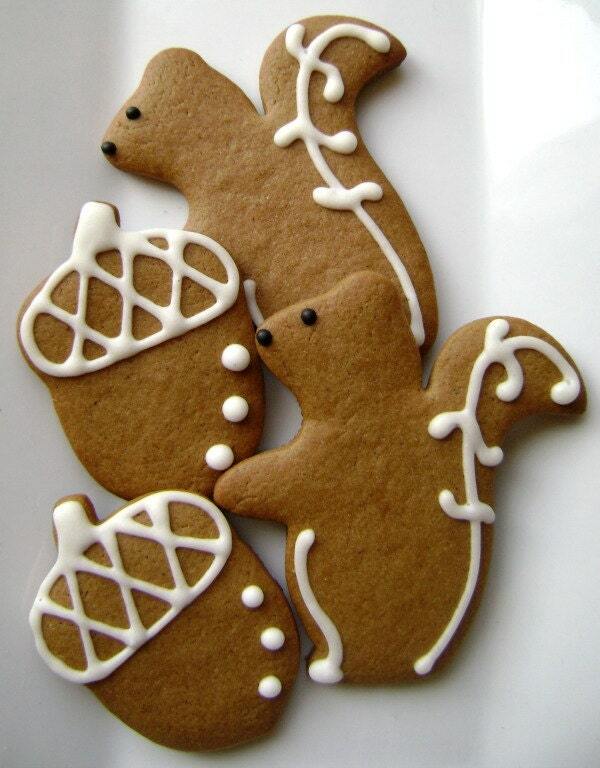 Soft and spicy but not too spicy gingerbread squirrels and acorns. The squirrels measure approximately 3 1/4" by 3" and the acorns measure approximately 2 1/2" by 1 1/2". There are 2 dozen cookies per order. They come together in a clear cellophane bag tied with a white grosgrain ribbon. Please note these cookies are not individually wrapped. If you are interested in individual wrapping for favors, please contact me for pricing. We can ship directly to the recipient. Please let us know their address and what message you would like on the gift card in the "notes to seller" during checkout. Need a different amount or color? Custom orders welcome! Contact me for more details. All our treats are made in a facility with wheat, eggs, nuts and seeds. If you have any questions, don't hesitate to contact me. 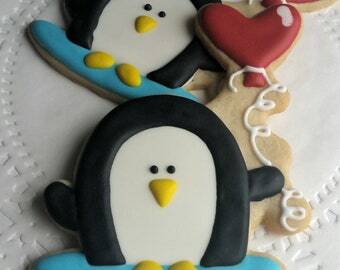 These cookies were just as delicious as they were beautifully done! I have ordered from this shop before and she never disappoints! The cookies were perfectly made and packaged well. What beautiful little cookies! They arrived in great time and are as expertly iced as shown on the website. I just wish I had ordered more of them! Thank you so much. Thank you so much! They arrived perfectly wrapped and beautiful!! Payment must be received within 2 days of purchase or your order will be canceled. Due to the nature of my product, I am unable to accept returns or exchanges. I take every precaution to make sure your treats are securely packed for shipping. If your order arrives damaged, please contact me and I'll be happy to work something out with you. Cookies are baked fresh and shipped out one week after the date of purchase, excluding Sundays and postal holidays. Orders are shipped USPS Priority Mail (approximately 3-5 days in transit, however not guaranteed.) If you are ordering for a specific date, please order at least two weeks in advance. If you need them sooner, please contact me for availability to rush an order before purchasing. -All orders ship USPS Priority Mail.